Telemedicine vs. Telehealth: What’s the Difference? The intersection of medicine and technology can be a confusing place. Policy makers, vendors and advocacy groups often use imprecise language or throw out technical terms inconsistently. I’m sure we’re guilty of this from time to time. Although the terms telemedicine and telehealth are often used interchangeably, there is a distinction between the two. Telehealth is a subset of E-Health, which includes the delivery of health information, for health professionals and health consumers, education and training of health workers and health systems management through the internet and telecommunications. Telemedicine is a subset of telehealth that refers solely to the provision of health care services and education over a distance, through the use of telecommunications technology. Telemedicine involves the use of electronic communications and software to provide clinical services to patients without an in-person visit. Telemedicine technology is frequently used for follow-up visits, management of chronic conditions, medication management, specialist consultation and a host of other clinical services that can be provided remotely via secure video and audio connections. In short, all telemedicine is telehealth, but not all telehealth is telemedicine. Both are part of the larger effort to expand access to care, make health management easier for patients and improve the efficiency of the healthcare delivery network. Chiron Health specializes in software designed to support telemedicine and ensure provider reimbursement. 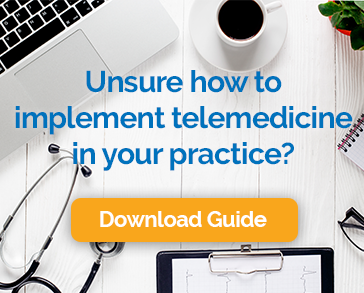 Ready to try telemedicine in your practice? Start for free!